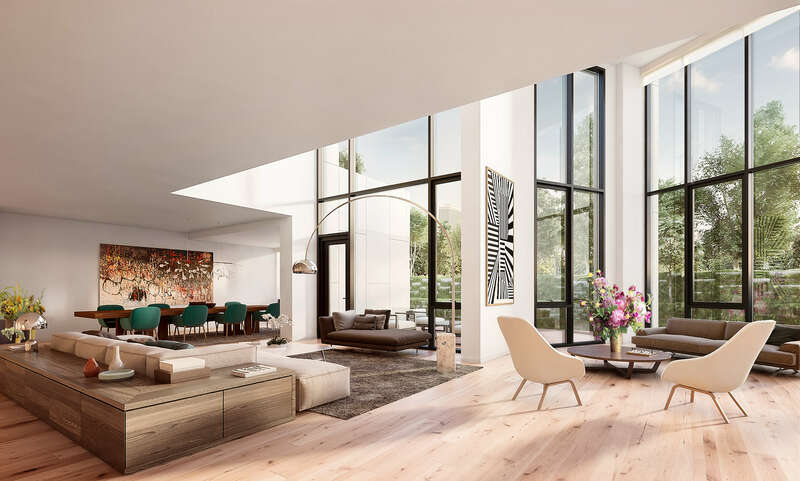 There are several factors that distinguish this condo complex, beyond the fact that it sits inside Brooklyn Bridge Park: few residential spaces in New York City boast 18-foot ceilings. Fewer still have a pet spa with dog showers. The building, designed by Jonathan Marvel of Marvel Architects — who redid the Studio Museum in Harlem and the St. Ann’s Warehouse performance space — is best suited for those who seek a home with more amenities than most, and the budget to buy in. The array of amenities include bicycle storage, 24-hour valet parking and concierge, two fitness centers complete with TRX training equipment, a meditation studio, and residents’ lounge. And with an anticipated LEED Silver certification, rainwater irrigation system, and composting units in every residence, Pierhouse is more than a luxury development, prioritizing sustainability for future generations. With 75 percent of the building’s 106 units sold, 25 units remain – a mix of two- three-, four- and five-bedrooms; most master bedrooms face Brooklyn Bridge Park and the East River waterfront. A variety of rooftop terrace configurations allow for entertaining with a view. N-1012, pictured below, is a three-bedroom penthouse with a private roof deck listed for $6.09 million. For more information, visit the Pierhouse website, or call (718) 765-3805 for an appointment. The sales gallery is located at 90 Furman Street, Residence N-220 in Brooklyn Heights.